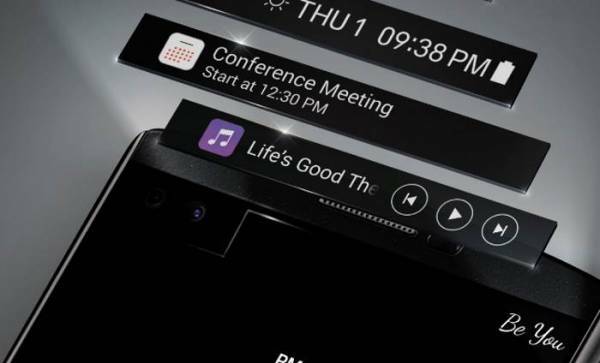 The Android smartphone LG V10, new smartphone, with a secondary display like a shortcut bar, Fingerprint reader and two 5-megapixel front cameras, Positioned in the high-end design, It will make its debut in the United States, LG V10 will apparently offered by T-Mobile, AT&T and Verizon, priced at full retail for $672. 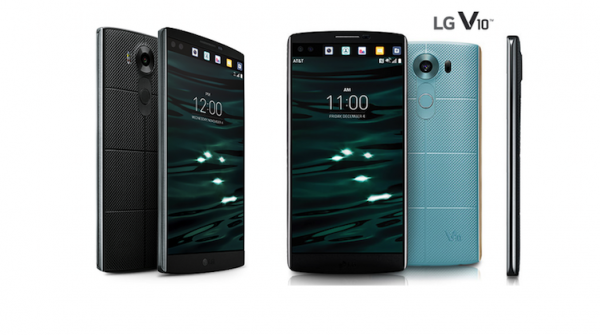 LG V10 features a 5.7-inch IPS display with a resolution of 2560 x 1440, pixel density of 513 ppi. A small screen right next to the front camera, this is a second IPS display features a 2.1 inches and a resolution of 160 x 1040 pixels. The second display continues to work, displaying the time and date, including announcements, weather news and updates, while the 5.7-inch display is turned off? The second display reduces power consumption, If the 5.7-inch display is turned on, the second screen can be used as a shortcut bar to favorite apps. In addition, smartphone owners will receive notifications about incoming calls or messages. Smartphone measures (159.6 x 79.3 x 8.6 mm) and weighs 192 grams. Thus, it is bigger, Thicker and heavier than the Galaxy Note 5 of Samsung, an identical 153.2 x 76.1 x 7.6 mm and 171 gram weight. LG Dura-Guard Glass, intended to protect the phone better against shocks and falls – especially on the vulnerable corners and edges. The frame consists of the same hard and hypoallergenic stainless steel. Inside, the LG V10, the manufacturer chosen the same hardware as its previous model LG G4 used. Equipped with the six-core Qualcomm’s Snapdragon 808 CPU (two Cortex-A57 cores and four Cortex-A53 cores) coupled with 3 GB RAM. For internal data storage, there is an internal memory with a capacity of 64 GB. A microSD slot for external memory supports upto 2TB . The LG V10 powered by the 3,000 mAh battery. Thanks to Qualcomm’s Quick Charge 2.0 technology, According to the manufacturer, it charges 50 percent of the battery in just 40 minutes. Adreno 418 GPU is starting to show its limitations. For photos and video chat, LG V10, features a 16-megapixel primary camera, with f/ 1.8-aperture and an optical image stabilizer. Good for video recording in Full HD,UHD. Smartphone owners can able to shoot videos in 16:9 and 12:9 ratios. it is the best smartphone In order to adjust parameters such as shutter speed, frame rate, ISO speed, white balance. In addition, And Dual 5MP (80/120 degrees) front-facing cameras. This is to ensure for Selfies with a wide angle of 120 degrees. Multi-View Recording mode still allows the simultaneous use of the two front cams. And runs with an operating system of Android 5.1.1 Lollipop. LG V10 will get the Marshmallow update. LG V10 compatible with 32-bit Hi-Fi DAC by ESS Technology, Wi-Fi 802.11 a / ​​b / g / n / ac, Bluetooth 4.1, GPS, NFC. For the first time LG smartphone also features a fingerprint reader to unlock the device. It is also compatible with Samsung Pay in the US. But LG’s popular Knock-code function for the purpose of unlocking the device, a battery-saving feature called Doze. It will be available in black, white, beige, and blue opal colors.